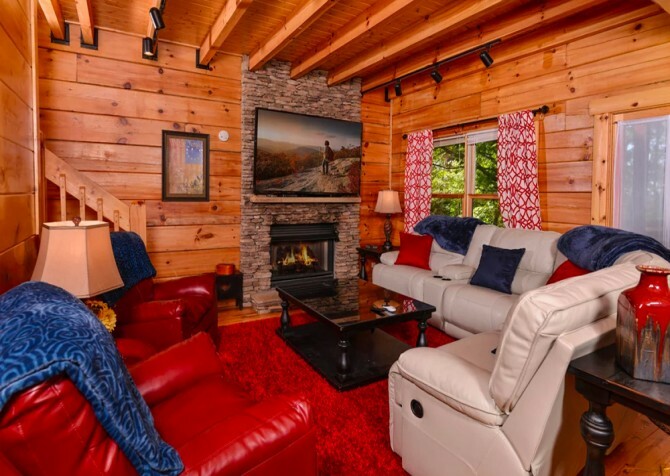 Take your family or a group of friends on a trip to remember at Keaton’s Cozy Cabin in the Great Smoky Mountains. 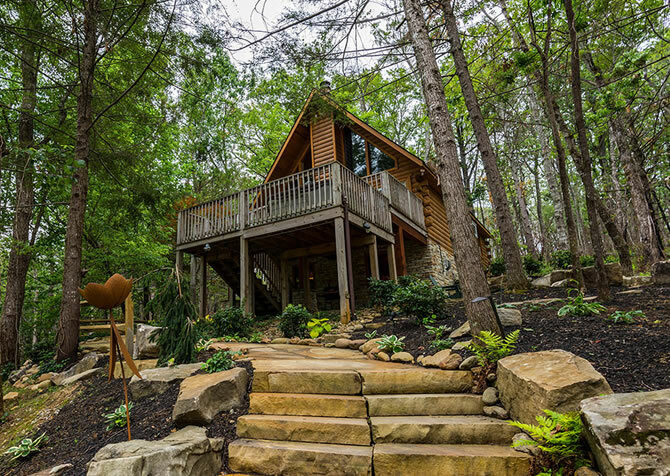 Featuring an outdoor hot tub, 4 big screen TVs, and stainless-steel appliances, this pet-friendly cabin in Pigeon Forge was made for quality time and precious memories with the ones you love. Soak in the lush wooded views over breakfast at the outdoor dining table on the covered deck, watch an action flick in the living room while the kids view an animated classic in the media room, and whip up fresh meals daily in the fully equipped kitchen — convenience at its best! Just after you arrive, enjoy a quiet nap on the reclining sofa in the living room. When you’re rested and ready, flip on the big screen TV for a show or two while the puppy pals around with the little ones on the large area rug. Pile snacks on the large coffee table, grab a few throw pillows, and snuggle up for a film (via the provided DVD player) in the reclining love seat — complete with drink holders! As evening approaches, start a fire in the wood-burning fireplace, beautifully bordered with stone, and catch up on the series you’ve always wanted to read but never had time to start in the — you guessed it — recliner! With an open concept throughout the home, keep the conversation going while preparing every meal, refilling the popcorn bowl, and pouring drinks in the fully equipped kitchen. Featuring stainless-steel appliances, make a fresh cup of joe with the coffeemaker, wash fruits in the double sink, brew a special herbal blend in the tea pot, store restaurant leftovers in the refrigerator, warm lunch in the microwave, purée a green pesto in the blender, boil beef stew on the stove, bake biscuits from scratch in the oven, and mesmerize Fido with the can opener. Don’t forget to let the dishwasher clean up the mess while you head to town for a shopping spree! Gather everyone in the dining area just off the kitchen for a homemade meal. Serve the main dishes from the countertop nearby and place the sides on the dining table for 6. While the crew chows down, your furry best friend will have a comfortable place to rest (or beg) on the large area rug. When the food settles, clear the plates for a sweet dessert paired with hot coffee — yum! Head upstairs past the gorgeous wooded views from the large windows to the media room/loft bedroom for a movie marathon or a board game (buy new ones from a local store or bring favorites from home). Doubling as a bedroom, the media room boasts a big screen TV, 2 bean chairs, 2 arm chairs, a comfy sofa, and 2 twin beds. Set out a few sodas on the end tables, place savory snacks and sugary treats on the coffee table, close the curtains, and get cozy for movie night! Plus, with a ceiling fan overhead, this space can keep the overexcited little ones cool and comfortable. When the villain is finally defeated on the flatscreen and the children are tucked away in bed, mosey downstairs to your own bedroom escape. Each harboring a big screen TV, ceiling fan, and king-size bed, the 2 king bedrooms in this cabin are quite evenly matched. After a hot shower in one of the 2 nearby bathrooms, let a romantic comedy lull you to dream land and use the ceiling fan to keep cool on summer nights. With paved parking for 4 and only 2 steps into the cabin, unloading the luggage will be a cinch. Simply pull up the steep, paved driveway, unpack, and head inside for good times aplenty. Even better, chill on the deck rocking chairs, unwind in the outdoor hot tub (with a convenient table for your towels), host a barbecue shindig with the gas grill, and dine with friends at the outdoor dining table for 6. In the morning, fix a bowl of fruit for two and relax in the sitting area — close to nature with a wooded view. Want even more?! 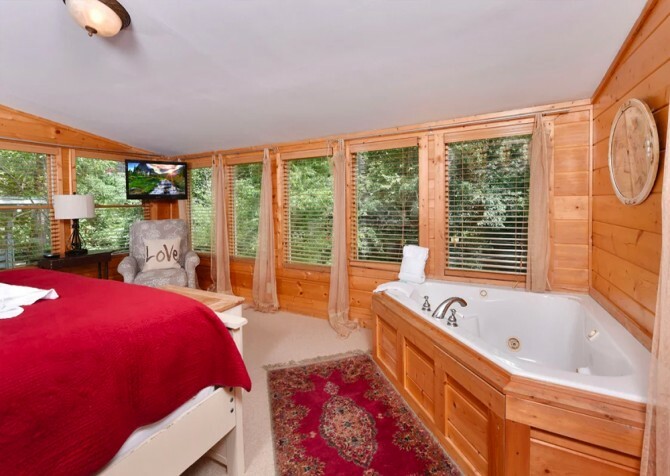 This Pigeon Forge cabin comes with high-speed internet for streaming enthusiasts, a washer and dryer to recycle towels and clothes, and a VCR for home videos. However, the best amenity of all is that this cabin is pet friendly, making it the perfect place for your pup to play with new toys, curl up for snuggles, and soak in the fresh mountain air. After getting ready at the cabin, head to town to check out the local scene in Pigeon Forge. From intriguing museums to musical dinner shows, entertainment is around every corner! Re-enact your favorite scenes from the film classic and learn the heart-wrenching reality of the Titanic at this famous museum. Venture to the Apple Barn Winery to taste local wine creations and bring a few bottles back to the cabin to pair with a delectable dinner. Ready for a performance like no other with country music galore? Pick up a few tickets to the Country Tonite Theater — you won’t regret it! "This was a most beautiful cabin. Up to date everything and clean. Very comfortable and plenty of room. The beds were like mine at home, the hot tub was fully functioning and amazing and the privacy was nice. I recommend you stay! We didn’t want…"
"My family and I LOVED this cabin! We had 2 adults and 5 children, and there was PLENTY of space for us all! We didnt want to leave!! The place was nice and clean when we arrived, Up to date appliances all in working order, COMFY beds in rooms and loft, AMAZING hot tub on deck, and 4 big screen tvs to enjoy! Only thing we didnt like very well was the turn in/driveway! Turn in can be rather tricky for larger vehicles/suvs and driveway is a bit steep. Would definitely recommend to others and will definitely vacation with Cabins For You again!" Thank you so much for this wonderful review! We are so happy to hear you and your family loved the cabin! We know how hard it can be to leave an awesome vacation, and we hope that you will be coming and staying with us again very soon! "The cabin was great and updated. It was nice and cozy and had plenty of space for 4 adults and 4 children. The only thing that was disappointing was there was no dish soap or dishwashing liquid, and it stated there would be some to at least start us off. The location was close to town with plenty to do and was an easy drive. There is a steep hill to get to the cabin and the parking is pretty tight. So really only room for 2 cars, even though it says 4. Overall it was a great stay and our family had a wonderful time!" We're so glad you enjoyed your family stay at Keaton's Cozy Cabin! We do apologize that you did not receive the dish soap in the starter kit, and we will also look into adjusting the parking information. We are super grateful for your feedback and look forward to your next memorable stay in the Smokies! "This was a most beautiful cabin. Up to date everything and clean. Very comfortable and plenty of room. The beds were like mine at home, the hot tub was fully functioning and amazing and the privacy was nice. I recommend you stay! We didn’t want to leave." Yay! We are so excited to read your review! 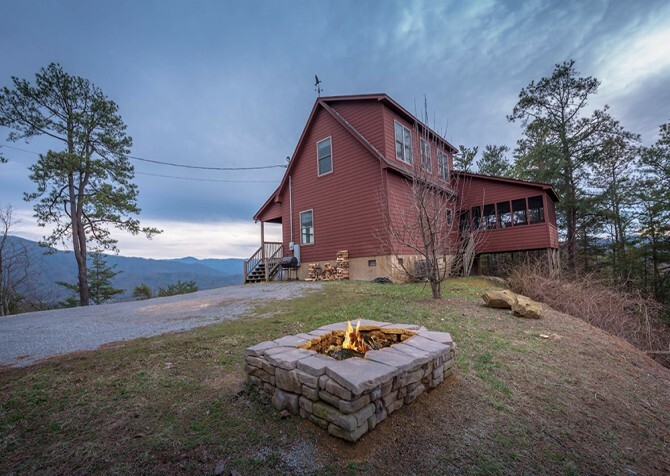 It makes us so happy to hear how much you enjoyed your Smoky Mountain stay at Keaton's Cozy Cabin. When you're ready for another memorable cabin stay, we're here for YOU! "I was looking for a spontaneous trip to the Smoky Mountains. 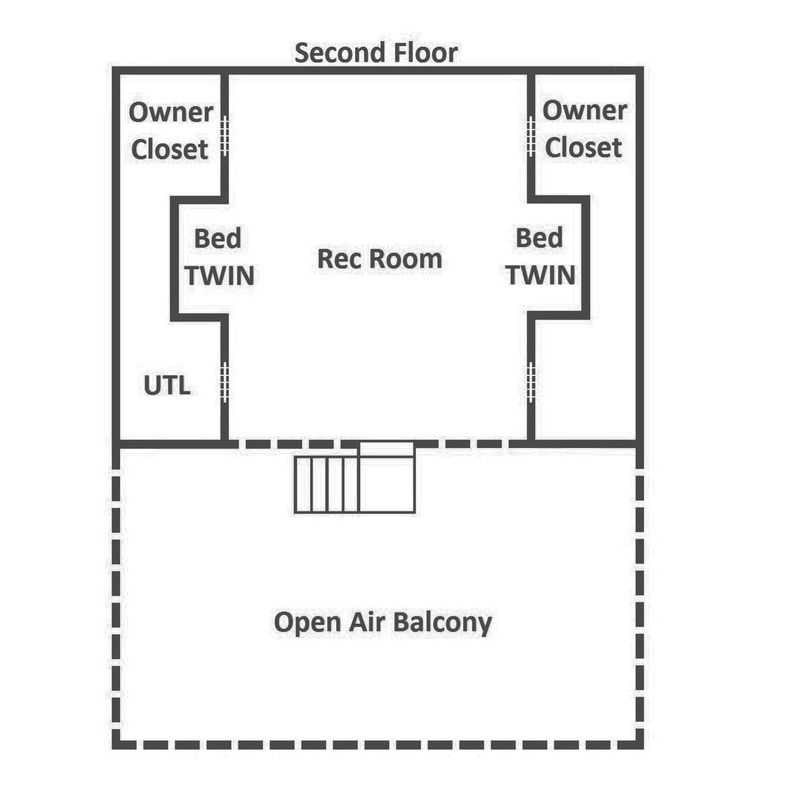 I needed a cabin that was “pet friendly” and had two master bedrooms. Cabins for You provided both of these needs. I was able to do a same day booking. The cabin we stayed at was just lovely! The kitchen was well equipped, the hot tub was beautiful, and the location was just 10 minutes from Sevierville. It made for a great few days of hiking and relaxation!" "My family and I stayed in a cabin whose name fits it perfectly! (Keaton"s Cozy Cabin) it was clean and definitely cozy! My family and I felt right at home! We had 2 adults and 5 children and it fit us perfectly! 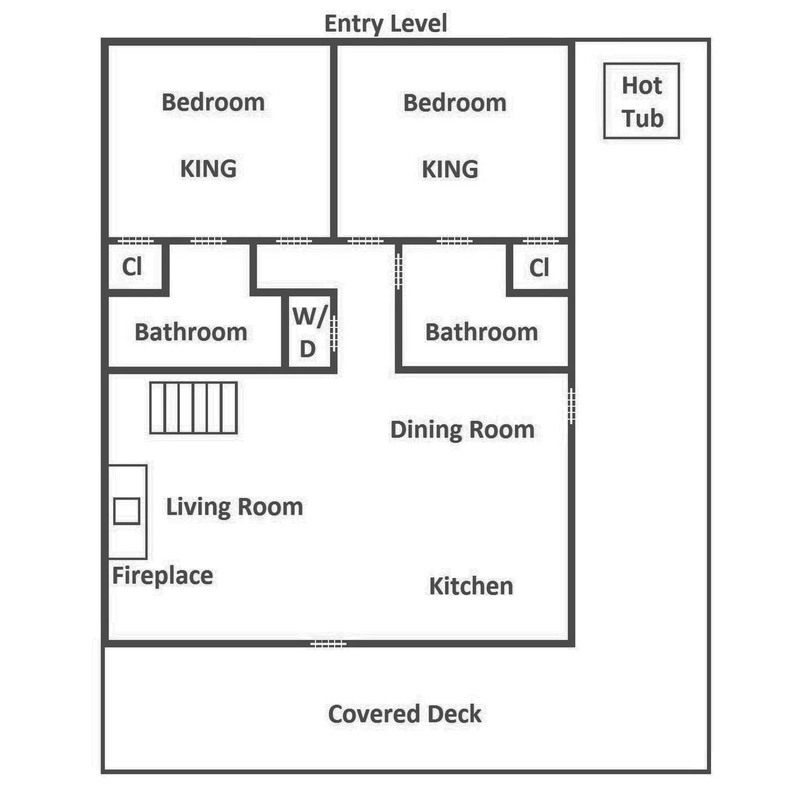 Update appliances in working order, clean linens and towels for everyone, 4 big screens for the whole family to enjoy, and a nice big hot tub on the deck to relax and unwind at the end of the day! Only thing that we had trouble with was the driveway! It has a rather sharp turn in that can be tricky for larger vehicles/suvs!"